I had one more paper reveal that I couldn't get out on time before the retreat to post. I was working on this until 3am in the morning before the retreat and didn't have a chance to photograph it before having to pack up everything to take to the retreat. This is based on the Bird Song papers from Graphic45. I love their papers; always so bold and different. 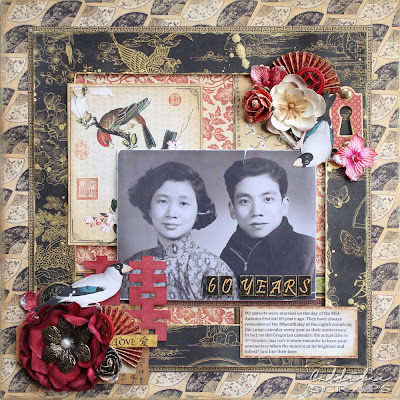 You have to love their vintage style and turn-of-the-century (last century) vibe. There have been many Asian (Chinese and Japanese) influenced lines lately by other paper brands as well, but I love that HKMC brought this one in. These papers feature mostly Chinese motives, with the phoenix and dragon, Shanghai girls mini posters, lots of Chinese calligraphy and ink paintings. They even have Japanese Geisha girls which are ideal for cutting out. Here is my first layout with this paper line. It's a wedding photo of my parents. Gosh, they look extremely young here. They met as students and didn't have the full white dress wedding as they were in China during the Mao reform. 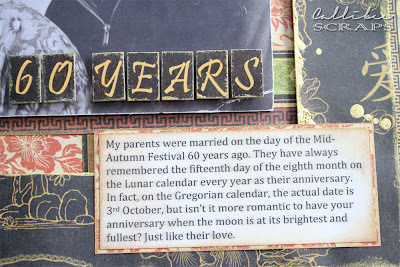 This year they celebrate sixty years of marriage and have one of the most amazing relationships I ever seen. I can only hope to have what they have when hubby and I get to that age. I kept the layout simple with a frame to highlight the amazing wedding photo. When I work with old photos, I first scan them into my computer and print out a copy to work with. I inked all the papers with gold rather than brown as I wanted to keep the layout bright but vintage at the same time and gold is also a Chinese colour. 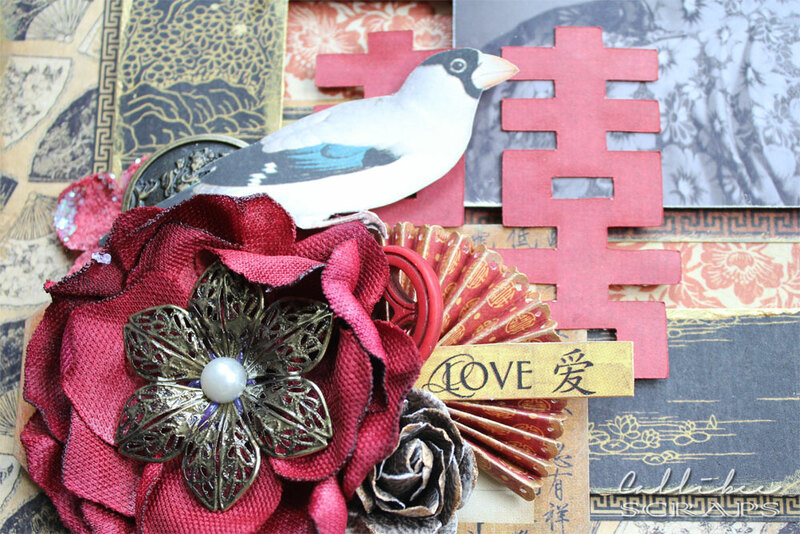 A cluster of flowers in similar shades complement the paper. See the similarity between the white flower and bird on a branch that I cut out to match the blossoms on the painting underneath. I die cut a red "double happiness" character with my eClips to add to the wedding theme. I scored and folded some mini fans to tie in with the backing fan paper. I fussy cut the pair of finches and perched them on opposite corners of the photo. Is this not the most romantic story? 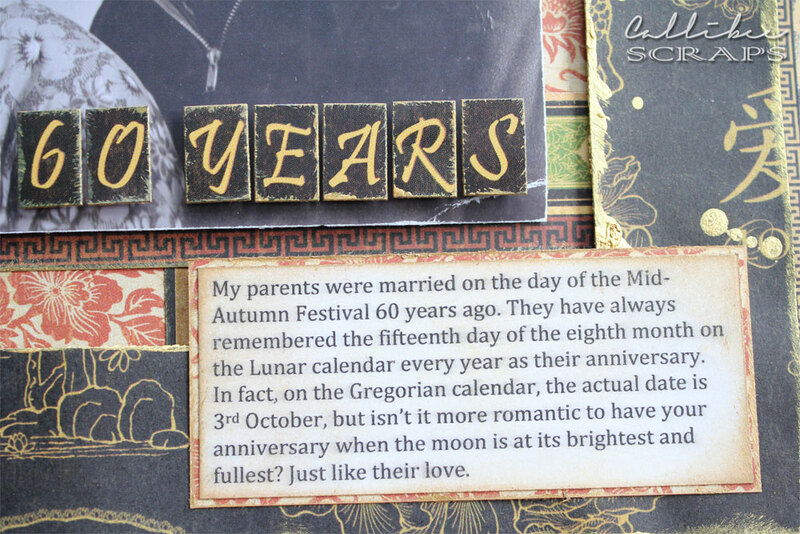 The mid-autumn festival is also regarded as a lover's day. So befitting. 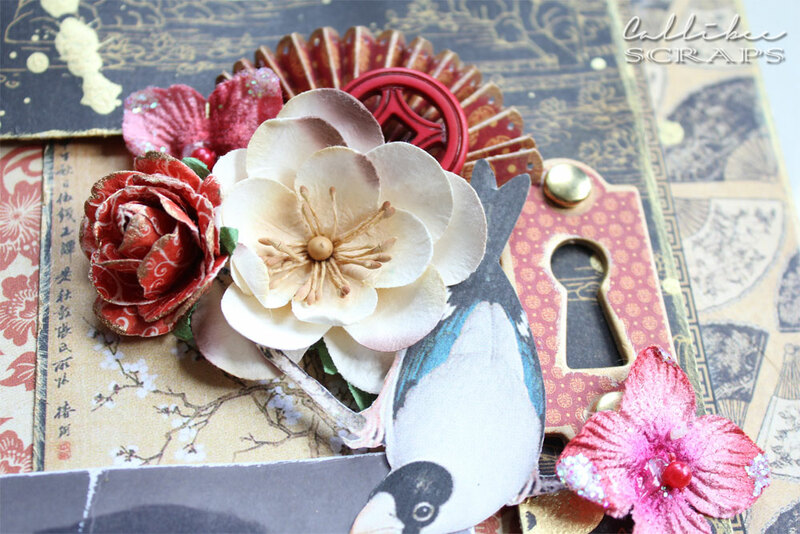 Extra Elements: flowers by Prima and Petaloo. Brass trinkets and flower from stash. Gold paint by Ranger Adirondack Metallics.